The Pelouze scale I use for quick weights (as used here)has stopped zeroing out. Something appears to be sticking in it’s rack and pinion assembly. So I’m pulling it’s tabs and taking a look inside! This scale’s at least 50 years old. And with a bit of lubrication I’m hoping to have it around for another 50 years. Interestingly, aside from the polymer rack and pinion driving the front dial the scale seems little changed from the original patented in 1898. Earlier examples are on display at the Made in Chicago museum and website. Construction of the Pelouze scale chassis consists of stamped steel with slot and tab construction. In addition there’s a metal dial, steel pins and hinges, a spring… And that’s about it. So there’s a look back at a little piece of history. Next up I’ve got a pile of (more) cheap filament from EBay (that I used as a test weight). These rolls promise to be within 2% of tolerance and we’ll see how they stack up! Re-use is a common theme. And metal is one of the easiest things you can possibly re-use. But to re-use it you first need a metal melter to melt down the old metal before casting, forging, hammering, milling, or whatever process you’ll use to turn it into something new. And that’s why I need a melting furnace. Fortuitously I happen to have a furnace that’s being scrapped. So I’ve decided to attempt to turn an old hydronic furnace into a new DIY metal melter. The product could be one-offs cast from metal, billets for machining, or even some stock for the lathe. And I realize how cost-impractical that last one is. But still think it might be fun to attempt! Now I’m entirely unsure if this undertaking will work. And aside from building a propane powered aluminum metal melter in a 5 gallon bucket one time I’ve got little experience creating metalworking equipment. But I’m familiar with the safety concerns of a fired system. And I don’t believe there’ll be an issue with the equipment itself aside from suitability for purpose. I intend to do a full series on building out the furnace over the next few months. Since we’ll be going into spring by the time the parts are acquired and everything’s cleaned up the timing should work. 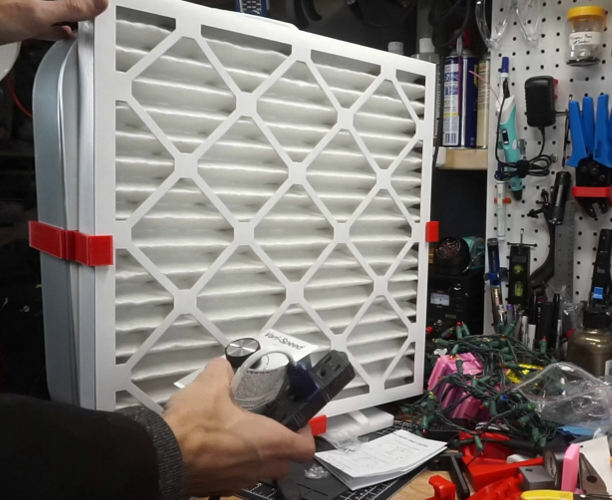 Building your own box fan filter is a great way to reduce the amount of dust in your workspace. And you can build it for just about the cost of the fan and a suitable filter. I’m taking that one step further and adding in variable speed motor control inline with the box fan filter itself. For the cost of an additional triac to chop the voltage to the motor I’ll be able to trim the fan speed up or down depending on the amount of noise and airflow I’d like. I’ve run out of workbench storage space for the last time! Today I’m taking a low cost Ikea sliding tray that was collecting dust and turning it into a workbench add-on. 3 months ago I set out to buy the cheapest PLA filament on EBay and see if it was total garbage. And I’ve now printed off about two thirds of the spool. What’s do the prints look like after printing out a pound and a half of plastic? It so happens that someone was having trouble writing a login script to run after failed attempts. And they needed not only a login script but one to run after some number of failed login attempts and do commit some arbitrary actions. With the old Craftsman drill press possibly squared I’ve moved on to checking for runout on the chuck. And to that end I’ve created a 3D printed runout gauge holder for round dial indicator. Branded the Mingxi MX-180V mini metal lathe this model is available in a few different configurations from different resellers. And they’ll all have (for the 180V) a digital read-out and 8″ by 12″ work area. Since I can’t find it anywhere online currently here’s the Features5.pdf file from Cinelerra-GG 09/30/2018 release. It documents the Cinelerra-CV and Cinelerra-GG feature set. Also, it coincidentally has the VP9 settings for Cinelerra that I couldn’t find listed anywhere else under chapter 3.4. Hopefully this helps anyone else whom can’t find it on the Internet while searching. And since you might be looking for the Cinelerra video editor you can find the -GG version at the project’s website.